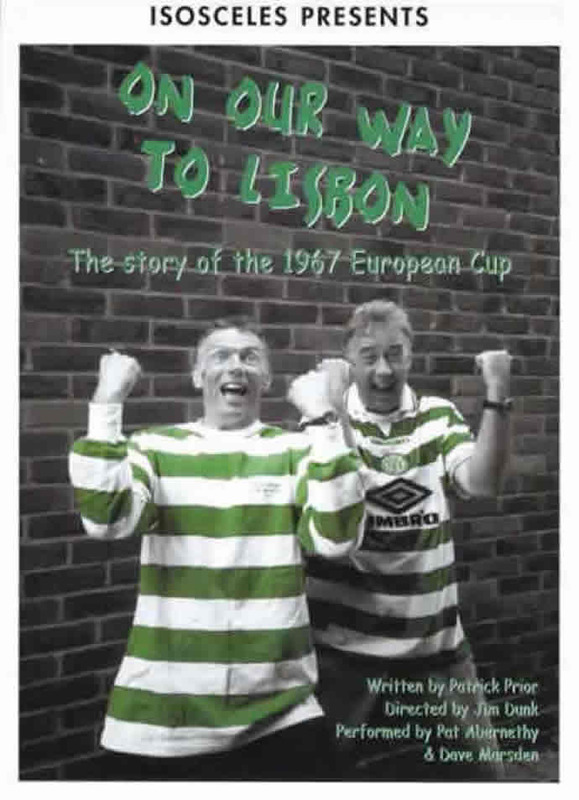 On Our Way to Lisbon (or The Italian Job) tells the story of how, in 1967, Glasgow Celtic became the first British team to win the European Cup with victory over the mighty Inter Milan. Two fans look back and fondly recreate how the Bhoys in Green and White beat the hardest team in the world and draped Europe in the green, white and gold. The whole mad and magnificent campaign comes to life as the two supporters become everything from a vicious Swiss football team to the entire population of Lisbon. Put on those scarves, dust off your passport and come with us once again as Celtic steam-roll over the best teams in Europe to become the immortal Lisbon Lions. 'On Our Way To Lisbon' is a two man play with a cast of thousands...physical theatre at it's best. Hilarious slow motion scenes served as match highlights, bringing tears from an audience who were clearly as much engaged in the football as the drama.It was high octane stuff and marvellously executed...I felt the entirely enthusiastic audience could happily have stayed for more. On Our Way to Lisbon is a superbly written and impeccebly performed work. Abernethy and Marsden are individually brilliant and work seamlessly together....Even those with little or no interest in the subject matter will find it hard not to be caught up in the tide of excitement. Even though this is essentially a tale about football, Patrick Prior's fantastically witty script and Jim Dunk's no fuss direction make this a play that will appeal to football fans in general. The dialogue, at times, is hysterical and the slow-motion match highlights prove particularly effective. As the 1967 tournament progresses from the first round to the final, Denny and Tony have the audience engrossed...As an interpretation of football events On Our Way to Lisbon makes potent drama out of past glories, which is enough to recommend it. .... a sublime mix of physical theatre, conversational dialogue and hilarious impersonation - the two actors never let up the pace until the euphoria of that final whistle... well scripted and expertly performed by the two actors. 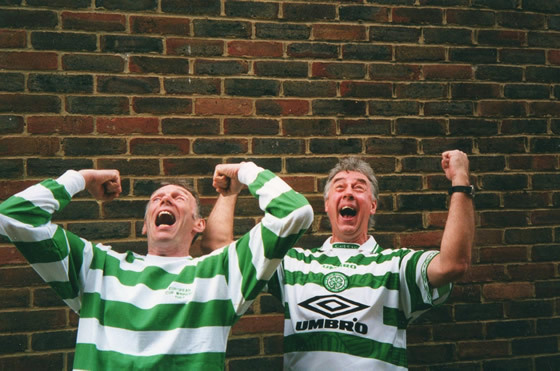 Two fans look back fondly on how Glasgow Celtic became the first British team to win the European Cup. If you loved 'Stones In His Pockets' you'll love this show too. The nice thing about Priors play, and Abernethy and Marsden's performances, is the evocation of football's lost golden age...it also reminds us of something we forget; that the beautiful game can inspire a simple, honest joy. When comparing life's high points - the birth of children, etc - the pair conclude that they were never as happy as when their team triumphed in Lisbon. Actors Pat Abernethy and Dave Marsden take us through each leg of the competition, home and away, with energy, humour and bonhomie. Moments such as Denny's use of Tony's head as a radio, as he desparately tries to get a decent reception of the commentary of an away match, are theatrically inventive..... A folk play like this has plenty of opportunities for audience participation as we are treated to a game-by-game and, quite literally, goal-by-goal account of Cetic's victorious run.... Enjoy the memories! A physical two-hander... the strong point is the spirited performances... All credit to Abernethy and Marsden. Pat Abernethy and Dave Marsden succeed in getting inside the skin of the most important people in a football club - the fans. The amzing thing about the play is that is succeeds without being needlessly over-triumphalist...The story of each match is told using a finely judged balance of commentary, reaction of the coaches, slowmotion replays and crucially, the reactions of the fans themselves...It also holds much for fans of other clubs, and those who don't even go to football matches. 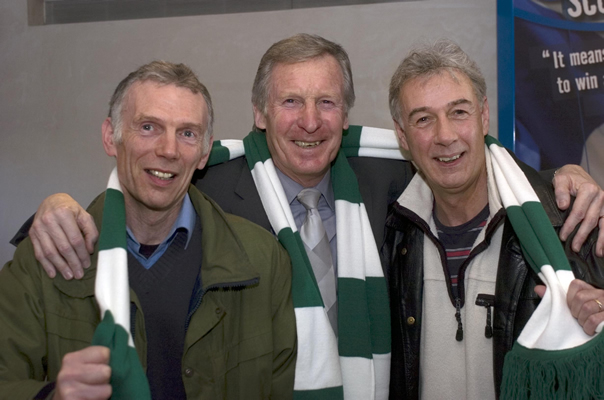 It is the energy generated on stage by Pat Abernethy as Denny and Dave Marsden as Tony which turns the play into much more than a misty-eyed trip down memory lane for Celtic fans. That, and some top direction by Jim Dunk. While maintaining the two central characters and developing them through the play, the two provide comentary - both live and on tne radio, act out vital points in the games in slow motion and generally manage to get you onto the edge of the seat to find out what is going to happen - even though you know the final result. The slow motion replays are particularly hilarious. As one of the hard men from Vojvodina, picks on a poor, innocent Celtic player, for example, the slow motion effect allows the two to show all sorts of ironic facial expressions of the players. Being able to drop back into the characters of the two 50-year-olds, waiting for the funeral of a friend who has just died of cancer, gives Abernethy and Marsden the chance to provide some gravitas to the piece. And it helps to give the feeling that they were actually there, that these are real people. Far from being a game of two halves, this is a fascinating piece of social commentary. The two performers do a remarkable job of ringing the changes as they take us through each game...Everything is done with such infectious good humour that it never flags...There's particular charm in seeing two soberly suited middle-agers jumping to head a winner or doing a spectacular slow motion dive. Your emotions will be drained from the incredible journey that Tony and Denny take you on from the very start...The hairs on your neck stand to attention and do not fall untill the final curtain. In between they dance with laughter at the humorous parts of the play. The balance of the two characters makes this possible as they seem the perfect complement to each other...As the play draws to a close our two characters are standing singing the song that all Celtic supporters would proudly have sung 40 years ago, "We Shall Not Be Moved". At this point you can't help but want to join in...The play makes you feel as if you were there and so the urge to sing along is testimony to the magical spell that is cast upon you for its duration...This is a must see performance. In May 2006 Pat and Dave performed the play at the Kings Theatre, Glasgow which was the start of their relationship with the highly respected production company QDOS and Robert C Kelly Productions. This relationship will hopefully take ON OUR WAY TO LISBON to other major theatres throughout the world which goes to show how highly respected this play is. Although we look forward to performing the show in large theatres we will continue to perform it at similar venues to those listed above. Exciting times indeed for this wonderful piece of theatre ! The play is 65 minutes long and has been very favourably reviewed by the press. A Two page article in the official Celtic magazine "Celtic View" (August 2004) is testimony to the high respect that this play has earned. It has attracted a great deal of interest and an enormous amount of positive feedback from those who have already seen it - not just football fans but from fans of good theatre who know little about football !